I am a 5th year bilingual kindergarten teacher. I am also a union member. I believe that my union fights for not only the rights of my working conditions, but also the environment of my students learning conditions. One cannot be separated from the other. Saving our Schools is as tied to keeping collective bargaining rights for our teachers, as it is lowering class size. Below is an article written by myself and Adam Sanchez, a Portland Public Schools educator, about the solidarity rally held by Gresham-Barlow Education Association, Parkrose Faculty Association, and Reynolds Education Association and the struggle to settle a fair contract. 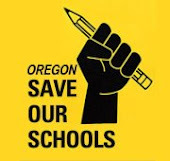 As Educators from Gresham-Barlow Education Association and Parkrose Faculty Association face a strike vote on Wednesday evening, April 11th 2012, I want to shed light on why these districts are in the difficult position of voting to strike. Emily Crum and Adam Sanchez report on a key showdown for Oregon teachers. SOME 1,500 teachers and community supporters in Oregon gathered in the Gresham High School gymnasium March 20 for a rally that brought together the Gresham-Barlow Education Association, Reynolds Education Association and Parkrose Faculty Association--three teachers unions in East Multnomah County that are all facing attacks by local school boards. Margaret Butler, the executive director of Portland Jobs with Justice, and other supporters came to the rally in solidarity with the three unions. As Butler explained, "Teachers all over our state have been taking it for years in terms of cuts, in terms of higher class sizes, in terms of not getting the support to do their job, and it's just great that these three groups of teachers, who are facing another set of contract cutbacks, have decided to stand up." The three school districts are claiming that the budget crisis is forcing them to extract massive concessions from the unions. All three school boards are demanding a freeze in teacher pay and benefits. In addition, the Parkrose school board is asking for a retroactive pay cut, taking away pay increases teachers previously bargained for. In Gresham, the school board is asking for teachers to take five unpaid furlough days, while in Parkrose, the board is asking for 10. This means that in Parkrose, where the monetary cuts are most severe, teachers would be receiving up to $1,000 a month less in pay for the next six months and between $300 and $600 less each month after that. While the school boards are claiming teachers are overpaid, the reality is that these cuts to pay and benefits would be devastating for teachers and their families. As one teacher put it in a recent opinion article in the Oregonian, "I need to make more money to ascertain and assure the future of my own children and my own future. I do not own a credit card; I do not qualify. I cannot purchase another home should I lose this one; I do not earn enough. I am a teacher, and I cannot afford to send my eldest son to college." BUT THE struggle in East Multnomah County isn't only about defending a decent standard of living for teachers. Joyce Rosenau, president of the Reynolds Education Association, emphasized that the budget shortfalls are being used as a pretext for attacking non-fiscal parts of the contract. "We have lots of issues in our contract--that have nothing to do with money--that are under attack now," she explained. "And so we find that they use the financial excuse as a chance to attack other pieces of the contract." The reality is the [Parkrose] school board and superintendent are exploiting the budget crisis to go much further than just balancing a budget. They are using the budget crisis, shock and awe, to destroy the teachers as a collective body, destroy their union. Inevitably, this must undermine teaching and real education for school students in Parkrose. What the board wins now, it has no intention of giving back later. Its proposed cuts and imposed working conditions--for students as well as teachers--inside the schools will be permanent. In all three districts, teachers are facing a reduction in preparation time, and in Reynolds, the school board is demanding the removal of contract language that requires any preparation time for teachers during the school day. Also in Reynolds, the school board refuses to acknowledge the need to have scheduled bathroom breaks for elementary school teachers because of cuts to support staff who would cover classrooms in the past. 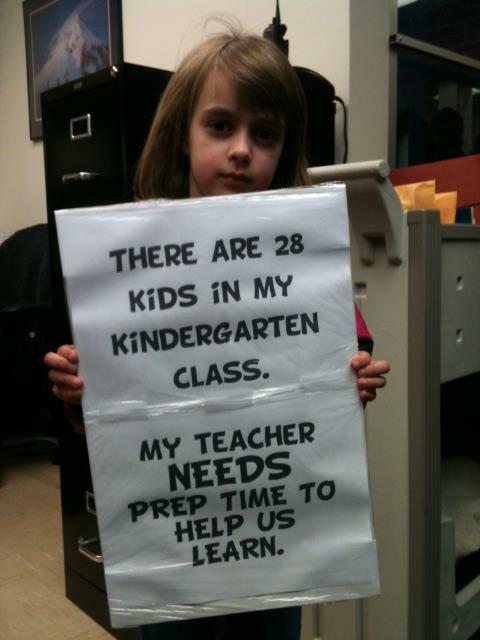 In Gresham, counselors at all grade levels would be required to substitute for teachers up to two hours a day. The Gresham school board also wants to erode teachers' collective voice by removing the requirement that the district take any input from staff when changing the structure of the school day. In addition, both the Gresham-Barlow and Reynolds Education Association are facing attacks on job security. In Gresham, the school board wants to be able to lay off teachers according to "competency," rather than seniority. In Reynolds, the school board wants to be able to use anonymous complaints as justification for disciplining or terminating teachers. When you think statewide for teachers all around the state--if prep time goes, if unsigned complaints are allowed, if class load increases, it sets a bad precedent...I see this as a larger national effort to crush public employee unions--and specifically teacher unions because we're one of the larger unions left. This is why we're asking for people from around the Portland and East-Metro County Area to stand up for our kids because they are the ones that will ultimately suffer because of these terrible proposals. There are, of course, answers to the districts' fiscal problems that don't involve solving the budget crisis on the backs of teachers. In Gresham-Barlow, the district has cut certified school staff positions by 14 percent since 2008 while at the same time doubling the number of administrators in the district office. A similar pattern has occurred in Parkrose where the school board found the money to give the superintendent a $7,000 raise. This brings her total compensation package to around $170,000 a year, over $30,000 more than the mayor of Portland. In Reynolds, largely due to previous salary freezes, the district has $20 million left over from previous budgets that is sitting unused while the school board pushes for another freeze to teacher pay and benefits. Fiscal responsibility is the school board's mantra, but this represents a carryover of 20 percent when the Oregon School Board Association advises a budget carryover of only 6-8 percent. Meanwhile, the school board plans on increasing the salary of the new superintendent and new assistant superintendent they plan to hire this spring. And of course, while schools and public services across Oregon have felt the painful cuts of the budget ax, Oregon's 1 percent continues to thrive. Oregon's mushrooming millionaire households could easily cover the East Multnomah County school budget deficit. Large corporations, many of which pay no state income taxes , could also easily fill the budget holes. Oregonian Phil Knight, the chairman of Nike and 60th richest person in the world, with a net worth of $13.1 billion, could single-handedly cover Oregon's entire $3.4 billion budget deficit and still be a multibillionaire. But common-sense solutions like these would require a social movement powerful enough to scare politicians into action. YET THE scale of the attacks that teachers are facing is forcing them to act now. In Gresham-Barlow, a district with more than 550 teachers, the school board voted March 13 to implement parts of its final offer. This imposed contract went into effect just before spring break. When teachers return from break, assuming the school board continues to avoid the negotiating table, the union will be left with two options--either vote to strike or accept the punitive contract and allow the school board to gut their right to collectively bargain. In Parkrose, the smallest of the three districts with close to 200 teachers, the school board has declared an impasse, and after the "cooling-off" period ends April 11, the district can vote to implement their final offer. In Reynolds, the largest district, with nearly 600 teachers, the school board has not yet called impasse, though it has been bargaining for over a year, and 13 articles of the contract are still open. The board is likely trying to wait and see what happens in the other districts, while hoping to push off the possibility of a teacher strike into the summer, when it would be less effective. This was extremely challenging to organize initially because teachers consistently work over eight hours a day and don't believe that they could possibly get their job done in eight hours. It was real tough for a lot of people to not spend their evenings and their weekends grading papers, making lesson plans, etc. The reality is that if school districts did not have this free labor that educators continually give with all their heart, the school systems would collapse. The intent of this work-to-rule campaign was for the district to see that we were in solidarity with each other, and that if they were going to implement a contract, than we would not volunteer extra time. It also helped teachers recognize for themselves how much they give every day and use that energy under these stressful times to give back to their own families and friends. Every single thing you have that makes your day possible--the contract money that you have, the insurance benefits that you have, your prep time, pay for extra duties--the district didn't give you any of those things. They never came in one day and said, 'Gosh, those teachers are such great people. We want to make sure they have enough personal leave. We want to make sure they have enough insurance. We want to make sure they have lots of time to plan great lessons for their kids.' Your district never said that. For 40 years, [the union] has said that, and your district has fought every single word. Out here in East County, an ill wind is blowing. It is a wind of hidden money and union-busting, of disdain and disrespect. The school board negotiation provisions that we all face are neither reasonable nor necessary. They are provisions designed to take back our hard-fought contract negotiated in years past. We stand on the shoulders of those teachers who came before us. We owe it to them to not capitulate and to not lose those victories they fought so hard to win. We may be three locals, but we face one crisis. Our school boards are leading us down the same path. And while the Reynolds district may be a little bit behind our East County colleagues, we will stand together as we weather this storm!